(Phys.org)—A team of researchers with members affiliated with the University of California, the University of New Orleans and the University of Calgary has uncovered some of the impact of secondary loss or simplification of the adhesive pads on gecko feet over time as some species adapt to changes in their environment. In their paper published in Proceedings of the National Academy of Sciences, they describe field studies they conducted and what they found in doing so. Everybody knows that geckos can climb vertical walls—so enamored are people with this special skill that whole areas of study have been dedicated to studying and duplicating what the tiny creatures do so easily. Less well known is that some species, in adapting to an environment where vertical climbing is not really needed, have lost the ability, while others appear on the verge of doing so. In this new effort, the researchers sought to learn why some species would give up such an ability, how it happens and what it means for the tiny lizards. To better understand the various gecko species, the researchers ventured into the wilds of Africa and collected specimens that together represented 14 different species—some were expert climbers, some had lost some of their ability, and others had lost it all together. Each of the specimens was studied under a microscope and filmed while running at high speed to better understand what was going on with their feet, or more particularly, the hair-like setae on the bottom of their toes that take advantage of Van der Waals force to adhere to a surface. In studying the photos and film, the researchers found that some of those that had retained their climbing ability resorted to curling their toes when running to avoid capture—a move that might not work out in the long run for geckos that are constantly being hunted. Thus, some that had lost some or all of their sticking ability had gained an ability to run faster—their feet were more solid and longer. Others had developed webbed feet to help them walk on sand, while others yet had feet that were more suited to digging. Loss of innovation, the team reports, is a form of innovation—a type that allows a species to continue to adapt to meet new needs or to move into other environments. The researchers noted that in losing their adhesion skill, the geckos had actually experienced acceleration in their evolution, indicating that changes were needed quickly in order to survive. A study led by biologists at the University of California, Riverside has found that evolution can downgrade or entirely remove adaptations a species has previously acquired, giving the species new survival advantages. The researchers focused their attention on geckos, specifically the adhesive system that allows geckos to cling to surfaces. They found that species of geckos in which the adhesive system was either lost or simplified — e.g., the Rhoptropus afer (a gecko species) seen in this video — saw elevated rates of evolution related to morphology and locomotion. 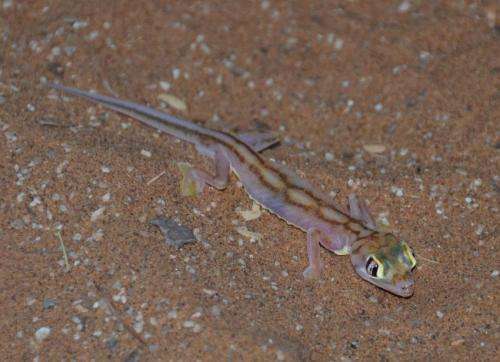 Rhoptropus afer is an exceptionally fast gecko that has a simplified adhesive system. 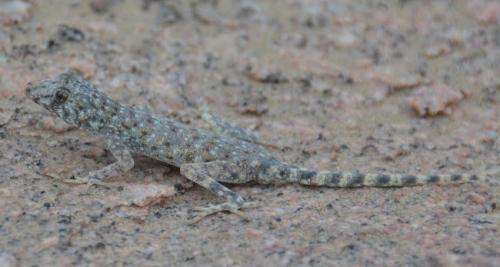 Web-footed gecko (Pachydactylus rangei). Credit: T. Higham, UC Riverside. Namib day gecko (Rhoptropus afer). Credit: T. Higham, UC Riverside. Innovations permit the diversification of lineages, but they may also impose functional constraints on behaviors such as locomotion. Thus, it is not surprising that secondary simplification of novel locomotory traits has occurred several times among vertebrates and could potentially lead to exceptional divergence when constraints are relaxed. 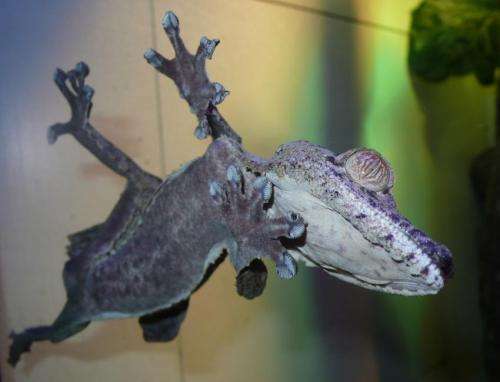 For example, the gecko adhesive system is a remarkable innovation that permits locomotion on surfaces unavailable to other animals, but has been lost or simplified in species that have reverted to a terrestrial lifestyle. We examined the functional and morphological consequences of this adaptive simplification in the Pachydactylus radiation of geckos, which exhibits multiple unambiguous losses or bouts of simplification of the adhesive system. We found that the rates of morphological and 3D locomotor kinematic evolution are elevated in those species that have simplified or lost adhesive capabilities. This finding suggests that the constraints associated with adhesion have been circumvented, permitting these species to either run faster or burrow. The association between a terrestrial lifestyle and the loss/reduction of adhesion suggests a direct link between morphology, biomechanics, and ecology.